1090 Pte Canadian Divisional Mounted Troops 8th Bn. b1891 Padley Wood, Hathersage. 1901C he was in Croydon and 1911C in London. 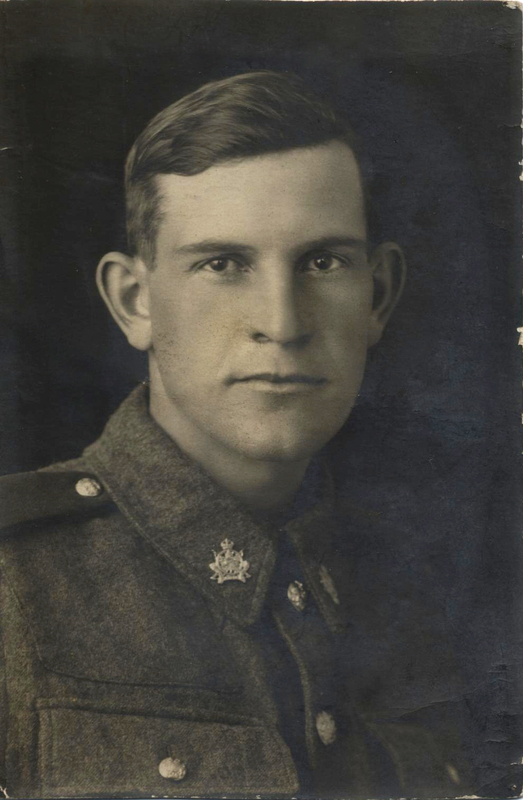 He then emigrated to Canada in 1913. He received his discharge papers on 30/5/1919 in France. From there he went back to the UK and to his wife, Margaret Alma Mann, (whom he had married in Feb 1919, presumably while on leave) and to his sister and Mother, who were living in Essex. Then, with his wife, he went to the US/Canada? They were certainly around Buffalo NY because he was granted a divorce there in 1927, approximately five years after Margaret went missing, presumed dead. (There was a suggestion she had fallen over Niagara Falls?). George certainly believed her to be dead. He ended up in Savannah Georgia USA. In 1928 (a year after his divorce), he married Mrytis Garfield of Savannah. In WW2 he still lived in Savannah Georgia, as part of the security services, which was all apparently a bit mysterious. His sister Jessie also went to Canada and farmed there. His other sister Margaret was also born in Hathersage. Their father was a railway civil engineer / tunnel manager. 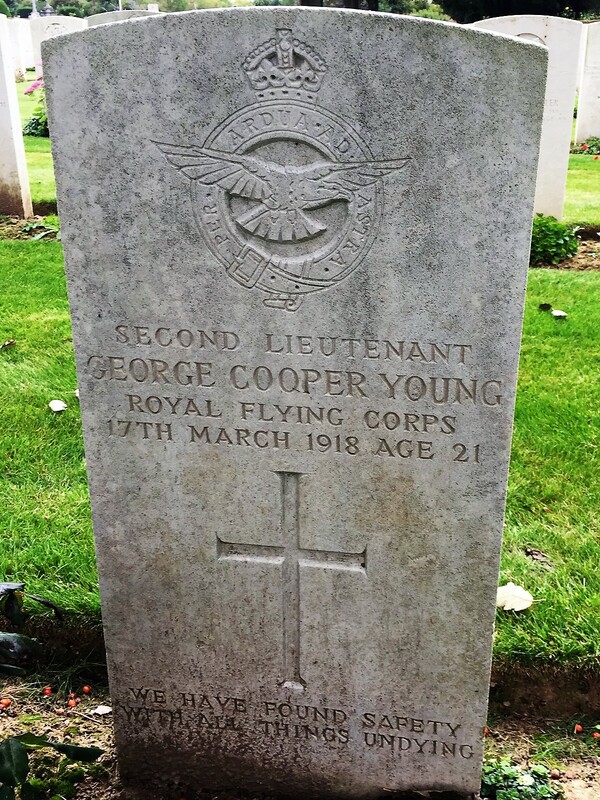 There is much more detail of him on the Ancestry.co.uk website..
✟ ≠ 2/Lt RFC 5th Artillery Observation Squad. Flew in RE 8 aircraft. KIA 17/3/1918, he had only arrived in France on 13/3/1918. 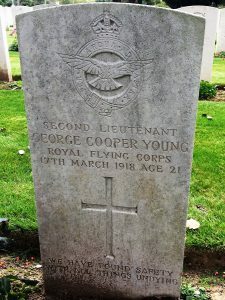 Buried in Aubigny Communal Cemetery Extension, Aubigny en Artois. Remembered also in St Peters Church Memorial Book, Brighton. b 1896 Wellingborough, Beds. 1911C living in Preston, Brighton, Sussex. His mother was Sarah Ann Cooper b1862 Hathersage, 1871C she was living at Barn int’Wood, Note Car Lane, Hathersage. Pte 17461 East Yorks, discharged 15/8/1916 as medically unfit due to GSW to waist. He was refused a pension as the Army alleged the wound was self-inflicted. He maintained he was cleaning his rifle when it went off. b1896 Sheffield. He was a fitter in a pit. Brother of Henry, above. Their mother was Mary Jane Richmond, b 1864 at Hathersage, 1871C living in Cabbage Row, Hathersage. Her husband Frederick Yates, died 1904 and she remarried Mark Darling 1908. 1911C living in Sheffield. Pte 1836 1/4 Y & L. He had a history of bad behaviour in T.A. before the War. He was called up, but deserted, spent time in detention, had a string of convictions for ‘Absent Without Leave’. Received GSW to leg in 1915, GSW to right of face & head (severe) in 1916. GSW (minor) to leg & calf in 1918. b 1892 Sheffield. 1911C a Sheffield collier. Brother of John William below. Their mother was Mary Jane Richmond, b 1864 at Hathersage, 1871C living in Cabbage Row, Hathersage. Her husband Frederick Yates, died 1904 and she remarried Mark Darling 1908. 1911C living in Sheffield. Д On the Wesleyan Memorial 1922. She was from 12/7/1918 until 13/9/ 1919, a shorthand typist in the Women’s Royal Air Force (WRAF). She joined in Doncaster and was demobilized from Lympne in Kent, age 20. This would seem to make her the first female from Hathersage to belong to the military and certainly to the Air Force. b Sheffield 1/11/1898 (possibly Millhouses Road). Listed on the 1911C as Irene Wright, living with her grandparents (the Harrisons) in Sheffield. According to the family tree her mother Clara Wright (neé Harrison) died in Hathersage 1908. Her father had died in 1904. The Harrison family who lived in Hathersage were keen Methodists, and Kate (In later life, she was always known as Renie), and William Snow (Billy) were married of the old Wesleyan Methodist Chapel, (now demolished and replaced) in 1922. Renie met her husband while in the forces. She was an Aunt to Peter Manning’s Mother, who said she spent a few summers with Renie and her children in Hathersage in the first few years of WW2, and she thinks their house in Hathersage was bequeathed to Renie at some time. Further research has shown that in 1941 Renie received no less than three bequests, and 9 Park Edge and ‘The Cottage’, Baulk Lane (now a listed building and recently renamed ‘Further House’) are mentioned. A maiden Aunt Katie (aunt of Renie), probably Kate Evelyn Harrison, (b 1859 Sheffield) who was living in ‘The Cottage’ when she died, left nearly £2,800 and a property on Roslyn Road to Renie. Kate Irene Wright’s ‘Harrison’ family did not move into the village till after the 1911C, Probate and family tree records indicate that in 1915 they were living at Park Edge and Roslyn Crescent. Served with the Merchant Navy during WW1. b 1898 Rowsley. His father Luther Buttery, b 1873 Hathersage and 1891C living at Besom Lane, (1911C he was at Rowsley, a signalman). Cousin to James Luther above, and to Lancelot William Hancock, Percy and Sydney Skerritt, and Luther Priestley below.